My love of hamburgers is well documented here. Judging by the popularity of such posts, I'm far from alone. 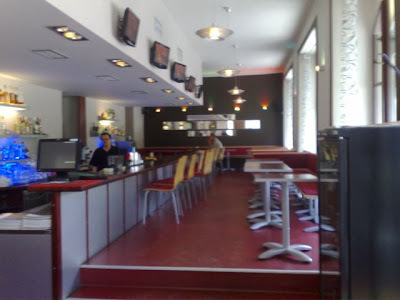 V had been having many meals at Bohemia Bagel in Holešovice and wanted to take me for their special Burger Friday. Having heard good things about their hamburgers from an online friend, I was more than happy to head over there. I'd been there for breakfast and wrote a post on it back in June 2008. We sat in the no smoking section, which is a separate room and feels a little isolated from the rest of the place. The main section of the restaurant can be empty in the afternoon, but it was full by 8 p.m. I'd recommend booking ahead. It's not a huge place. 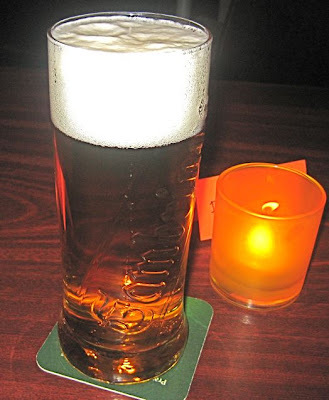 I was drinking half-liters of Gambrinus (30 CZK each). They had Pilsner Urquell, which I like better, but sometimes I'm not up for the higher alcohol content. 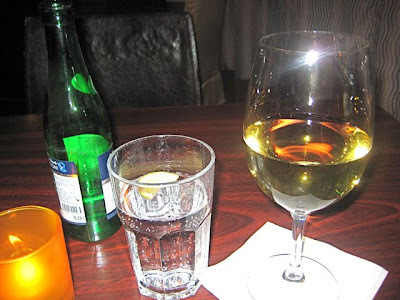 V had a couple of .2 liter glasses of Moravian white wine (40 CZK each) and a .3 liter bottle of Mattoni mineral water (30 CZK). On burger night, they double the selection of burgers on offer. There was a Greek burger, a tofu burger, a falafel burger, a fish burger, and a steak burger, to name a few. Call me boring -- I had the standard Bohemia Hamburger with American cheese and bacon. One of the great things about the burger was the price -- 155 CZK. I will now officially declare that this was the best hamburger I've had in Prague. Ever. Especially since the Czech Inn stopped making theirs. The prime reasons for a new favorite? 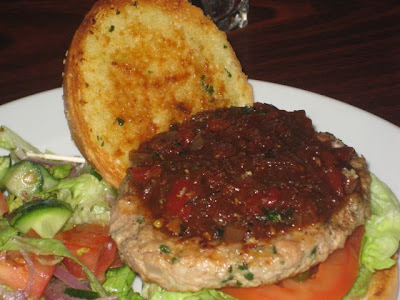 Great ground beef, and a perfectly formed patty that was flame-grilled. For me, nothing beats the smoky flavor from real fire. Then, there was the bacon. Lots of it. Three long, thick strips, cooked to near but not total crispness and placed with almost geometric precision across the top of the cheese. The raw red onion, lettuce, and tomato were cut to the appropriate size. However, they were placed under the patty, which was not ideal in my book. I like them better on top so the juices don't run through them. On the side, I had the sweet potato fries, which I liked despite their limp and greasy nature. They were included in the price. As far as I can tell, they weren't offered on the regular menu. The bun was toasted and buttered. Pretty good, although it was slightly more dense than a classic American-style bun. The positive side to that was that it held together under duress. Its holding strength was tested. It was seriously hard to get my big mouth around the whole thing. The burger was hard to put down in more ways than one. When you consider the great price -- it slaughters the competition. V had the Sante Fe Burger (155 CZK). It was made with freshly ground chicken seasoned with onions, cilantro, and jalapenos. You could really taste the cilantro, which I liked. The ground meat held together well. It was topped with a sweet tomato relish. She took the top off and ate it with a knife and fork. There was a side salad, which had a slightly sweet dressing. 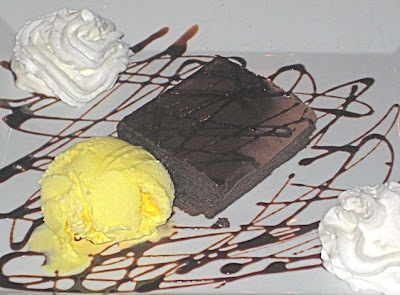 For dessert, I decided to try the warm brownie with ice cream (75 CZK). I've had their brownie many times, and it is quite good, very fudgy. But I'd never had it warm. Definitely nice, but one end was not as well-heated as the other. Also, they use an artificially-colored vanilla ice cream that many restaurants favor, and I dislike. I'm sorry, the natural color of vanilla is not yellow. The flavor does not taste natural, either. I should note that I heard that Brad Huff, a player in my previous post, will be playing guitar at the restaurant's Wednesday chicken wing night. At the end of our dinner, V bought some tins of Harney and Sons teas for herself and as Christmas presents. They were not cheap -- 220 CZK each. She bought a few as Christmas presents and kept some for herself. 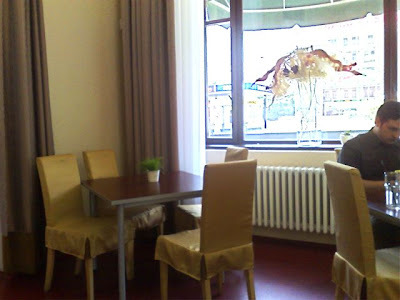 When we got the bill -- 555 CZK -- I saw that we received a 10% discount. I couldn't figure out why. So I asked the waitress. "Your, ah, girlfriend comes here all the time. I recognize her. Sometimes, I give a discount to regular customers. Is it OK?" she asked and smiled. "Sure, it's OK. Just curious. Thanks!" A nice touch. We enjoyed the irony. I'm the one who writes about restaurants every week, but she's always the one who ends up getting the special treatment. It left me with the good feeling that a love for Bohemia Bagel in Holešovice's burgers comes as much from a light tab as it does from a flame. Oh yeah, I'll second the "best ever in Prague" label. Best burger in town by a country mile. I've had LOTS of these over the last several months; they are not just good, but CONSISTENTLY good (unlike some very expensive burgers at other restaurants in this town). People should note that this is a quite different burger from Bohemia Bagel's other branches (which are good too); if you want the best, you've gotta make the pilgrimage to Holesovice. I'm at the Old Town location at least once every 2 weeks, specifically to get the burger and fries. And I introduced 2 friends the other day who are new converts. I strongly agree with your assessment and now have to try out the Holešovice location! Thanks! Good point about the beer. I didn't realize the percentage difference was that small. But in all truth, after three, the difference starts to make a difference for me. 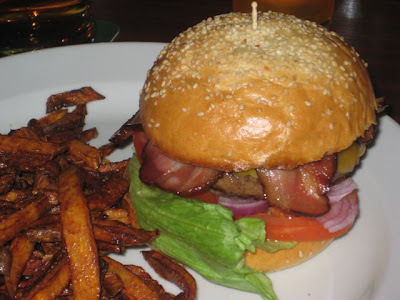 So, I just had a burger with cheese and bacon + fries at the Masná (Old Town) location and I must say it was great! The burger had everything right, it was warm and overall very good. The fries were good, as well. Potatoey and even little crispy. And the fantastic cheesecake! On the other hand, I have an older and rather unpleasant experience with Holešovice location. 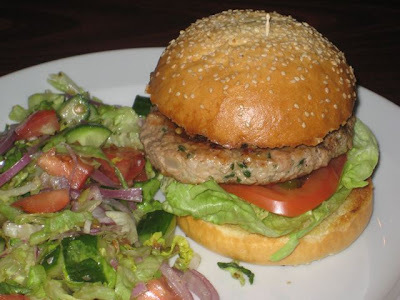 The burger was cold, there were some (and too many) herbs in it and it just didn't taste right. The fries were soggy mess of little potato edges. Holešovice may have the chef, but Old Town has the real burgers. 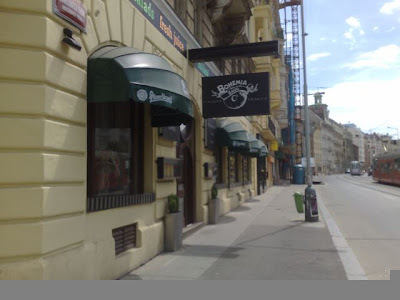 I'm only in Prague for a month and find this blog a breath of fresh air - so much so that it is difficult to post a negative comment regarding this restaurant. I suppose I'll survive this experience, though, and so will the your wonderful blog. Wife and I made the 'pilgrimage' last evening for Friday's Burger night. I was disappointed with this restaurant. The fries were really limp and greasy. I expect they sat for quite a long time before being served because they were nicely browned. Usually greasy fries result from low temperature frying and never brown. My major complaints lie with service and the comfort and decor of the restaurant. Our waitress managed to ignore us until I almost gave up on ordering a second beer. Granted, this is supposedly a bagel shop, but the decor can only be described as being dismal. And what's with the chemistry set at the end of the bar? Is that for mixing flavored vodka? Then there was the Czech couple with two small dogs who sat just across from our table. When another guy came in with his dog, they went absolutely nuts barking. I can't blame the restaurant except as far as they allow dogs in the place - unheard of in the US. Our waitress, who ignored my calls for another beer, delivered a bowl of water to the beasts without washing her hands afterward. The burger was really quite good, though. I had a burger in the Fridays at Andel during a visit a few months ago. It was dreadfully dry and almost inedible. I'll try the other Bohemia Bagel locations, but in the interim, I'll settle for the burgers and ribs in the Gate Restaurant in Prague 8, Karlin. 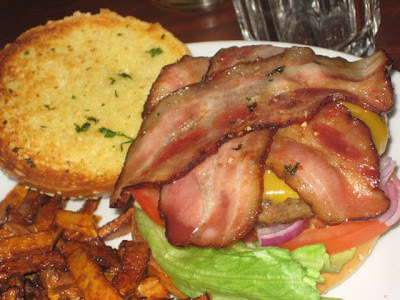 It is close to our apartment, offers reasonable prices and some nice fare - especially when it comes to burgers and ribs.